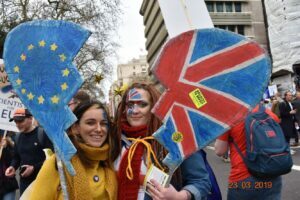 Saturday 23 March was another great pro-Remain demonstration in central London – the Put It to the People march – with record-breaking crowds of up to two million people. 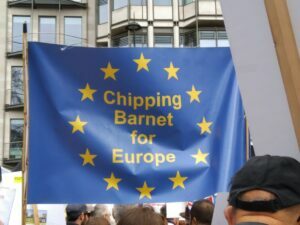 As usual, Chipping Barnet for Europe led a group from High Barnet Station, setting off at 11 and gathering more supporters at each stop till East Finchley: we wave our banner out of the door so that people can find us, and fill a couple of carriages. The atmosphere was joyful, peaceful and friendly as always, as children, babies, wheelchair users and the elderly joined the steady procession to Parliament Square for a rally and speeches from Lord Heseltine, MPs David Lammy, Vince Cable and Dominic Grieve, and Femi Oluwole, among others. The committee is pleased to have represented the constituency’s Remainers, and we were all proud to be part of this historic day.